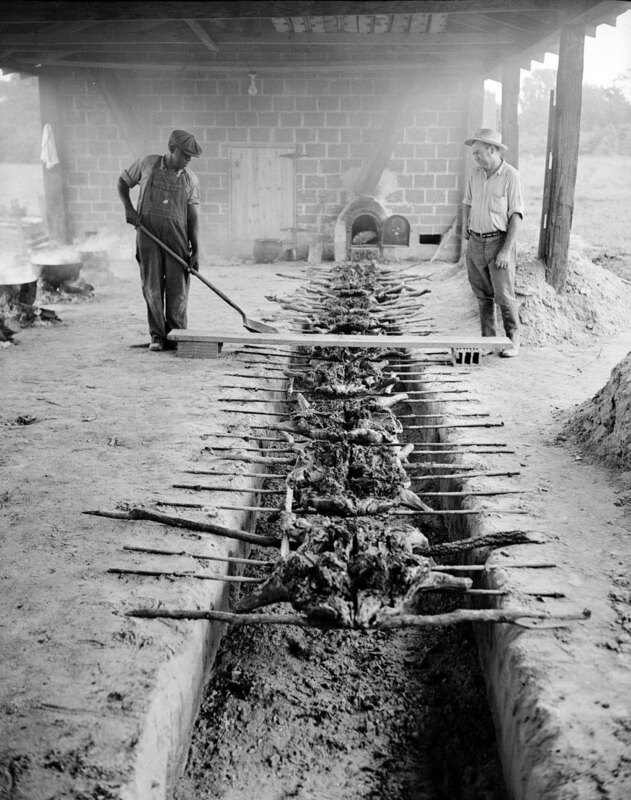 Smoking pork over an open pit near Rocky Mount, NC, September 1944. From the Conservation and Development Department, Travel and Tourism Photo Files. Call number: ConDev4648.5C. Learn more on Flickr. The Friends of the Archives (FOA) Annual Corporation Meeting and Program will be held on Monday, June 1, 2015 at 1:30 p.m. in the State Archives/State Library Building Auditorium (109 E. Jones Street, Raleigh, North Carolina). The speaker will be Dr. John Shelton Reed who will talk about “North Carolina and the Original American Barbecue.” For more information, see the event flyer. The Friends of the Archives is grateful for the support of The Pit restaurant and their donation of barbecue samples after the program. The Friends of the Archives is a 501(c) (3) non-profit organization formed in 1977 whose mission is to support, promote, and strengthen the collections, services, and programs of the State Archives of North Carolina. The mission of the State Archives is to collect, preserve and provide access to North Carolina’s documentary history and culture. This entry was posted in Events, News and tagged barbecue, events, foodways, Friends of the Archives, lectures on May 27, 2015 by Ashley. Join us as archivist Debbi Blake presents the second part of her lecture about Confederate spy Rose O’Neal Greenhow. Part of the State Archives Civil War Sesquicentennial series, this presentation follows Greenhow from her imprisonment to Europe and her downing while attempting to re-enter the Confederacy. Questions? Contact Andrea Gabriel in the State Archives at (919) 807-7326 or andrea.gabriel@ncdcr.gov. The State Archives of North Carolina State Archives collects, preserves, and makes available for public use historical and evidential materials relating to North Carolina. Its holdings consist of official records of state, county, and local governmental units, copies of federal and foreign government materials, and private collections. For more information about the State Archives, visit http://www.ncdcr.gov/archives/Home.aspx. The N.C. Department of Cultural Resources annually serves more than 19 million people through its 27 historic sites, seven history museums, two art museums, the nation’s first state-supported Symphony Orchestra, the State Library, the N.C. Arts Council, and the State Archives. Cultural Resources champions North Carolina’s creative industry, which employs nearly 300,000 North Carolinians and contributes more than $41 billion to the state’s economy. Learn more at www.ncdcr.gov. This entry was posted in Events and tagged events, lectures, United States Civil War on November 7, 2014 by Ashley. Did you know that Craven County was once home to a self-kicking machine? That Tarboro had a refrigerated pool in 1930s? Or that the state laid claim to the world’s longest beard? Come celebrate North Carolina history by hearing about some of its stranger stories. They can now be found in the State Library of North Carolina’s online encyclopedia, NCpedia! Make your own “Stranger than Fiction” booklet, filled with North Carolina facts and activities, or a paper cardinal, North Carolina’s State Bird! More of a dog person? Color a Plott Hound, North Carolina’s State Dog! A panel of experts will share lesser known, entertaining stories from North Carolina’s history! Kelly Agan, Digital Media Librarian, Government & Heritage Library, State Library of North Carolina. Robert Anthony, Curator, North Carolina Collection, University of North Carolina Chapel Hill. B. J. Davis, Education Section Chief, North Carolina Museum of History. Michael Hill, Head, Research Branch, North Carolina Office of Archives and History. Dr. William S. Price, Jr., Former Director of the N.C. Division of Archives and History and Former Kenan Professor of History, Meredith College. Mark Simpson-Vos, Editorial Director, University of North Carolina Press. This event celebrates the publication of thousands of articles in the NCpedia from the University of North Carolina Press’s Encyclopedia of North Carolina, Dictionary of North Carolina Biography, and North Carolina Gazetteer, as well as articles from the Research Branch of the Office of Archives and History, the Tar Heel Junior Historian magazine, UNC Chapel Hill Libraries, NC Natural Heritage Program, and more! NCpedia’s expansion has been funded in part with a Library Services and Technology Act grant from the Institute of Museum and Library Services. There will be something for the entire family including children’s activities! Join us to learn more and to talk with one of our NCpedia project partners! For more information, call the NC Government & Heritage Library at 919-807-7450 or send us an email. Reservations are not required. This entry was posted in Events, News and tagged events, lectures, NCpedia, press releases, State Library of North Carolina on September 10, 2014 by Ashley. Location: Auditorium of the State Archives and Library Building, 109 E. Jones Street, Raleigh, NC. Blockade runners successfully dodged Union ships along southern coasts. Historian Andrew Duppstadt gives a presentation on the development and use of blockade runners by the Confederate government and civilian companies to deliver material through the Union Naval blockade to Southern ports. For more event information, see http://nccultureevents.com/event/41175-blockade-runners or email andrea.gabriel@ncdcr.gov. This free lecture is part of the Second Mondays Lecture Series offered by the State Archives Civil War 150 committee. For information about parking and public transit for this and other events, see the State Archives website. This entry was posted in Events, News and tagged blockade runners, Dept. of Cultural Resources, events, lectures, United States Civil War on August 5, 2014 by Ashley. 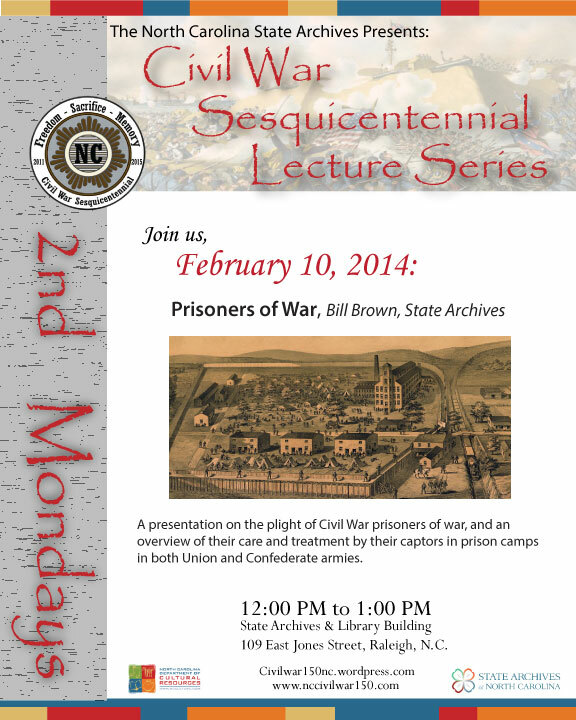 Event poster for the February 10, 2014 Civil War lecture on Prisoners of War. The State Archives Civil War Sesquicentennial Committee presents a lecture given by Bill Brown of the State Archives of North Carolina. The presentation will focus on the care and treatment of prisoners of war in both Union and Confederate prison camps. Where: Auditorium of the Archives and Library Building, 109 East Jones Street, Raleigh, N.C.
May 12, 2014: Peace Movement and William W. Holden – Chris Meekins, State Archives – A survey of the peace movement in North Carolina during the American Civil War, and the involvement of William Woods Holden in the growth of the movement. August 11, 2014: Blockade Runners – Andrew Duppstadt, State Historic Sites – An introduction to the development and use of blockade runners by the Confederate government and civilian companies to deliver material through the Union Naval blockade to Southern ports. November 10, 2014: Rose Greenhow, Part II – Debbi Blake, State Archives – The second half of the lecture titled “A Thorn in the Union’s Side: Rose O’Neal Greenhow” will be given as a conclusion to the earlier presentation given on November 9, 2011. This lecture will follow Greenhow from her imprisonment to Europe, and her death while attempting to re-enter the Confederacy. This entry was posted in Events, News and tagged events, lectures, United States Civil War on February 6, 2014 by Ashley. The Friends of the Archives will present its annual program Monday, June 24 at 1:00 p.m. in the auditorium of State Archives and Library building at 109 E. Jones Street in Raleigh. Following the election of new officers, Dr. Hilary Green, from Elizabeth City State University will present, “Lest We Forget: African American Memory of the Civil War in Hertford, NC.” The nation is well into the Sesquicentennial of the Civil War, making Dr. Green’s talk quite timely. Dr. Green is assistant professor of history and political science at Elizabeth City State University. Her work centers on race and gender issues in southern and U.S. history. Green earned her PhD at the University of North Carolina-Chapel Hill and an M.A. at Tufts University. Following Dr. Green’s talk, documents will be on display in the Search Room and we will offer tours of the State Archives’ stacks and vaults. Don’t miss this opportunity to have a behind the scenes look at our operations. The Friends of the Archives, Inc. was formed in 1977 to provide private support for the State Archives of North Carolina. Through generous donations, the Friends have purchased valuable collections for the Archives, helped to conserve documents and maps and have purchased chairs for the Archives’ Search Room. The Friends also sponsors workshops and activities, and helps to coordinate a volunteer and intern program for the State Archives. This entry was posted in Events, News and tagged African American History, events, Friends of the Archives, lectures, United States Civil War on June 17, 2013 by Ashley. Please join us for a free lecture entitled “Women Who Riot” on Monday, May 13, 2013 from 10:30am to 11:30am in the Auditorium of the Archives & History Building at 109 East Jones St., Raleigh, NC. The talk will be given by Sarah Lentz, who has previously written about the Salisbury Bread Riot. Sarah’s talk is part of the ongoing Second Mondays Lecture series sponsored by the Archives Civil War 150 Committee. This entry was posted in Events and tagged events, lectures, United States Civil War, women on May 8, 2013 by Ashley.